Planning a trip to Cape Pillar, I had an email from the Three Capes Track project which made clear the track would only be open Fridays to Sundays. Checked the parks website, where their track closure item from 2 October 2014 was the latest info. This remained the latest info on the website until the evening of 19 October 2014, and probably into tbe 20th. 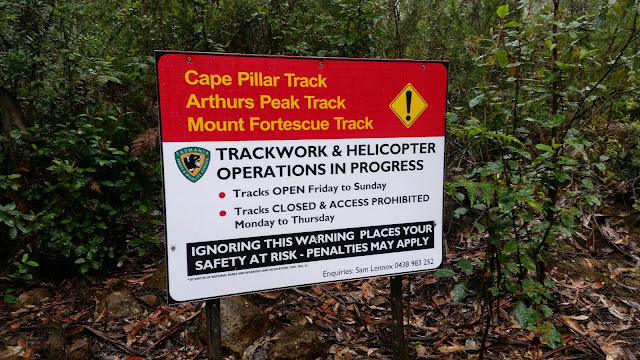 In the hope that maybe the track would be open earlier in the week than Friday, I rang the parks number for the Tasman NP this week. This is their Seven Mile Beach Office. The gentleman I spoke to didn't seem very well informed, but was able to confirm that I could walk the track on Fridays through Sundays, but he didn't think there was any chance of being able to do so earlier. Probably stupidly, I had also sent a Facebook message to them. This was belatedly responded to (2 days - love that immediacy which social media brings) by someone stating baldly that the track was closed Monday to Friday and only open on Saturdays and Sundays. I engaged in some discussion via Facebook private message, from the top of the Rodway Range. I pointed out that the website (at that exact time) stated clearly the track was open Friday to Sunday, and I had made specific plans to walk the track on those days. I made clear it was not good enough that they had incorrect information on their website. They responded by telling me that track closures could be "dynamic". Indeed. They also admitted the website info was "erroneous". Quite dishonestly, they then posted a new track closure item, and removed the old one. The new item, posted sometime between late on on the evening of 19 November and mid afternoon on 20 November is dated 6 November 2014. Talk about arse-covering. Hope nobody was travelling any great distance to undertake this walk on Friday, and were relying on the website information for their planning purposes. Wouldn't even have helped them to RING up, as when I did that I had the previous information confirmed clearly. A bit of competence and honesty would be a good idea, and perhaps their staff could all be informed about what is actually going on. And finally, an apology wouldn't have gone astray. Instead I got what amounted to a lecture about how track closures were dynamic, and I should ring up. Which I had done, and I had already provided that fact to whoever was responding to me. So, arriving at the end of the track, we find it's open from Friday to Sunday. Same sign out near the highway. Dishonest? Incompetent? Disorganised? Obstructive? And don't get me started on why we need to close an entire track just because it's being upgraded. Undoubtedly it's because the actual track work is so over the top as to be ridiculous. The amount of investment in these feats of engineering will never be repaid economically. It's just public subsidy of someone's dream about the perfect walk. There isn't much of the natural world left that you have to bother interacting with once they've finished. If you've seen the staircases up and down the hills at Cape Hauy, you'll have the picture. Same need for a nice tidy environment that leads to people wanting to get rid of the nasty, confused, disorganised forest and replace it with nice straight rows of plantation. It will also probably lead to railings on all the big dangerous cliffs, because, let's face it, if you can't get it together to walk on an uneven pathway and step over small obstructions, you can hardly be expected to avoid falling off cliffs can you. Too add insult, walking out to Cape Pillar reveals there to be NO active track work on the sections you are allowed to walk. The new sections where (apparently) work is going on are closed and you have to use the old track. I'm doubtful there is even any work on the two sections in question. I'll put up a post with some photos of the new splendiferous track.